The Customer Review Score is independently calculated, based on reviews from 250+ major websites & social sites incl. Tripadvisor & Facebook. 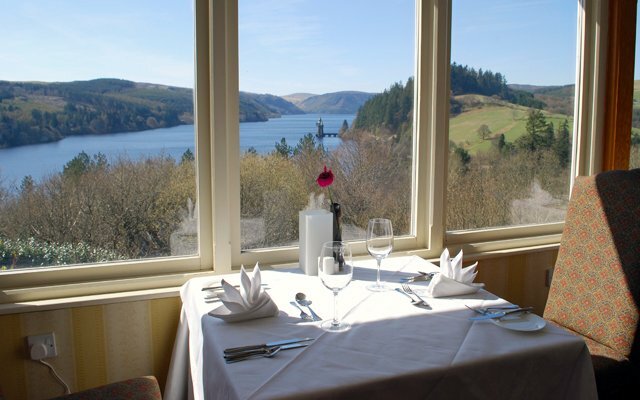 Cosy up this winter, country house style, with stunning Lake Vyrnwy as your backdrop. Enjoy the very best of winter with roaring log fires, delicious Welsh cuisine, a hot chocolate cream tea and a thermal spa experience. Begin your romantic getaway in classic style by checking in to your luxury room, popping open a bottle of chilled prosecco, and treating your tastebuds to a chocolate truffle. During your stay, you’ll enjoy mouth-watering 3-course dinners in the award-winning Tower Restaurant and in the gastro-pub-style Tavern Brasserie. Don’t forget to pack your walking boots – you can explore the breath-taking scenery surrounding the hotel. And, with an extra day at your disposal, Snowdonia National Park is just minutes away. 1) 15% deposit of the total booking value at the time of booking which is fully refundable and transferable when you cancel 48 hours prior to 4.00pm on the day of arrival. 2) Cancellations outside of the designated cancellation period and non-arrivals will be charged for the 1st night of stay. 3) The outstanding balance of the total booking value is due on departure at the hotel. 4) The ‘from’ price displayed represents the lowest price available over the duration of the offer. All prices are per room, per night based on 2 people sharing a double or twin room.